On April 3, “All-Japan Judo Invitational Tournament” was held at Fukuoka International Center. Shohei Ono, an athlete and graduate student at Tenri University, participated. Ono entered the 73-kg weight division. The tournament also determined spots in the Rio de Janeiro Olympics. Ono easily made his way through the first and second rounds. 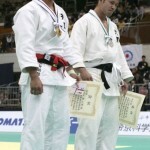 In the final round Ono went up against London Olympics silver medalist Riki Nakaya. Ono pressed ahead and won by judge’s decision. After the tournament, Ono was selected as a representative to Rio de Janeiro Olympics to be held in August, where he stated he would like to display Tenri Judo.